This Nikon magazine ad came out in the 1980’s. My friend Joe and I wanted our Nikons to look just like that. But we were in high school and didn’t get very many assignments to shoot in The Socialist Republic of the Union of Burma (where our hero, the owner of the F3, was apparently off to–after he finishes the generously poured scotch). So we took matters into our own hands. We bashed our precious Nikons on rocks. Sometimes, against each other. They looked a lot cooler that way. Joe even sanded down the black paint on the finder of his F3 to show off the brass underneath. What can I say. We were kids. That’s what sold well in those days–durability. There wasn’t really that much a camera could do back then, from a marketing perspective, other than be solid and reliable. Flash forward to today and we have the Olympus OMD-EM1. Durability is for sale again! This camera looks pretty tough. But there a lot of people who still use an F3 to shoot film. Will people still be using the OMD-EM1 30 years from now? Not knocking the Olympus–quite the reverse. It’s too bad that such a well-made machine will essentially be thrown away in a few years. But that’s the fate of all digital cameras, just like computers. On the bright side, digital cameras, at least mirrorless ones, have extended the life of a lot of old lenses. I recently bought a Nikkor 200mm f/4 lens for my Sony Nex7. It’s compact, built to last forever, and sharp even wide open. I paid, unbelievably, only $70 for it. The last circular polarizing filter I bought cost more than that! It’s in excellent shape, especially considering it’s at least 30 years old. There’s hardly a mark on it. This time, I plan to keep it that way. What a blast from the past, haha. I remember that ad. Tank like durability, that’s what made cameras cool back in the day. Thanks for the flashback. Thanks for your comment. Yeah, looks like the good ole days are back again! 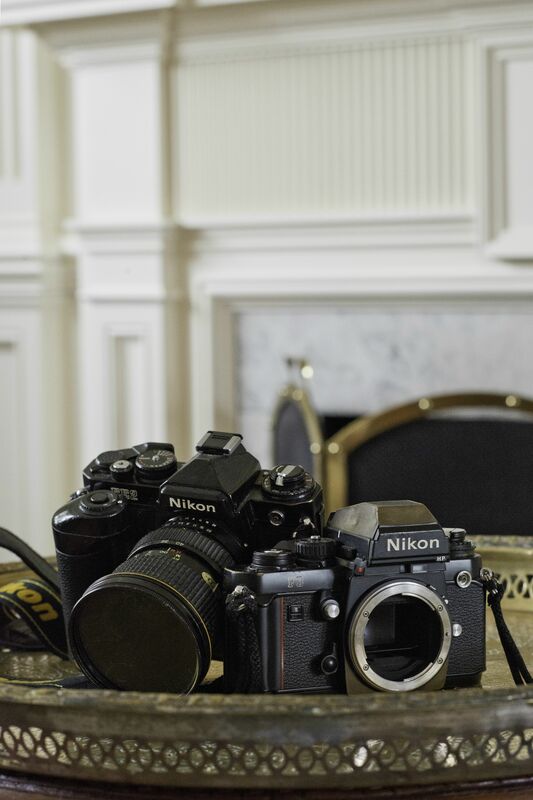 No, but I have recently picked up some more vintage Nikon gear (aside from the 200mm). I’ll talk about it in an upcoming post. Stayed tuned! Wow, Mike, I can’t fathom your friend’s level of insanity in sanding down his F3 finder! I wonder if it’s the same depraved guy who did this to mine as well? Sold it to me out of the back of a beige minivan back in the 80s. Oh well, takes all types to make the world go round. Gotta run…it’s shaping up to be a total Kodachrome 25 day tomorrow! PS. Nice blog…I’ve enjoyed popping in from time to time. Well, well, well. If it isn’t the star of the show himself, Joe, the Nikon-sanding artist who apparently still owns the brassy F3 in question! I guess that may have affected its resale value a little. 🙂 On the other hand, it’s probably the only Nikon F3 in existence with an all-brass finish finder. But Joe, I have to say, looks like 25 plus years of oxidation has darkened it quite a bit. Time for some Brasso, amigo. Thanks for stopping by, Joe.